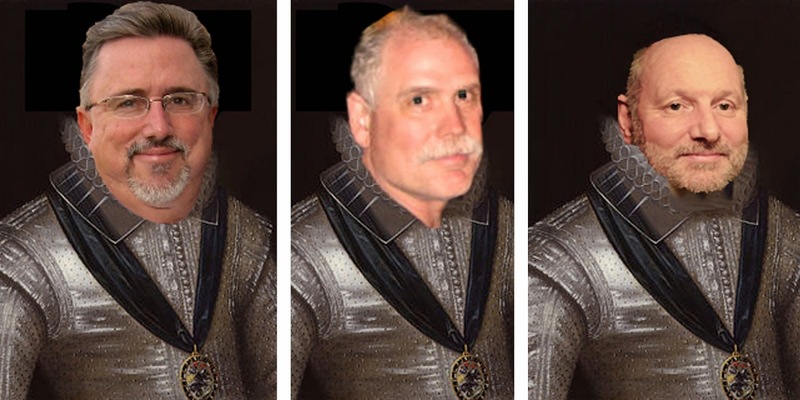 Our last post on our old site www.knightsmsa.blogspot.com announced that the Founding Father's were taking a much needed summer sabbatical away from the blogging world and use the down time to brainstorm a new approach for our Merry Band of Knights and Ladies. First, we decided that the use of the word Moleskine was limiting our potential for expansion. 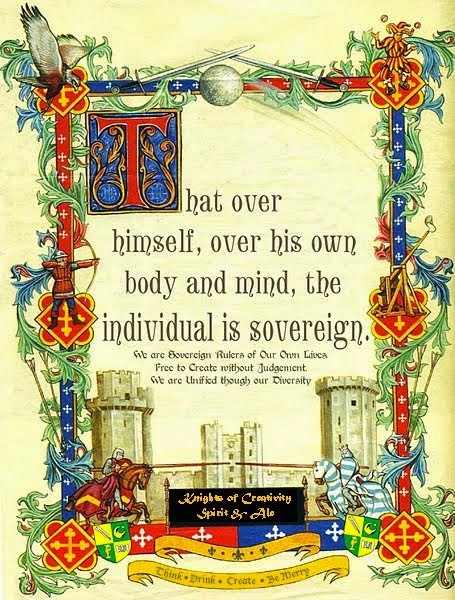 Of course, the Founding Fathers will continue to journal, doodle and otherwise express themselves on that fine written platform; however, the real Spirit of the Knights is one of Creation! Creation is incorporated into our ideals: "We are free to create without judgement"
Therefore, we have changed our name to the Knights of Creation Spirit and Ale. We still embody the ideals of Thinking, Drinking and Being Merry...but now we are challenging ourselves, as well as others, to embrace Creating through the whole process. 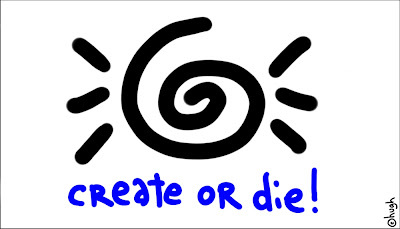 Create or Die. The challenge is to choose wisely...to choose to Create...which many times can be a deadly enterprise. By embracing the true freedom of our ideals, we must also embrace the freedom from fear. Fear often accompanies one who is about to create, which often keeps them from pursuing the creation and their dreams. So, FEAR NOT!!! Speaking of Freedom from Fear...when we took our break in May there was still Hope in the world...now...we are surrendering our very foundation to the fear mongers of this world, especially in American Politics. It's time for the Knights and their voice of reason to rise up and challenge the mindless minions that would bring our country one step closer to the closed, fearful, fundamental abyss that more closely resembles Iran than America. But that's the subject of another blog. Remember...we become stronger as individuals and a collective when we embrace the ideal of Unity through Diversity. Finally, it takes more than three outstanding gents, ie, the Founding Fathers, to make this dream possible. We are asking...neigh...begging for others to contribute to our cause by posting on this blog, friending us on Facebook and spreading the KCSA Gospel. We have decided to utilize Facebook to gain more members and to provide a forum for pictures, videos, works of art, etc. to be displayed by our members. So, Like Us and join us on Facebook and send it to your friends too! The More...The Merrier! Thanks for the invite! I am ready to get the creative juices flowing! I'm glad you'll be posting through facebook - that is a lot easier for me. So glad to see you back!!!!! Thanks to Sir Hook. A lot of people can create ideas; few can create and innovate. Very nice. be back soon...this is sooooooooooo exciting!! Glad to see you back. But... could you kindly remove Sir Richard of Montreal from your roster. I just saw the creed and I cannot subscribe to it. There is a Sovereign over my self, body and mind, but it's not me! Sir Richard...as requested we have removed your name from the roll. Pity, since you where one of our first Knights. Our creed has always been part of the blog, even on the old one, you just had to scroll down farther on that one. Besides, I as a practicing Catholic, have no issues with believing in both the Nicene Creed and ours. God only helps those who help themselves! Thank you for continuing to read our blog and if you change your mind, we'll be more than happy to welcome you back officially. Remember, we are Unified through our Diversity! Thanks, David. I appreciate it. Nothing personal. Glad the blog is back. None taken! Freedom from Fear!